While coaching acknowledged some serious mental illnesses that benefit from clinical psychology or skillful psychotherapy, it offered relief for others. It worked with many people that were lumped together, labeled, and treated for what were really “problems in living”—situations or circumstances that did not need a diagnosis or assume a pathology. This was a healthy turn that informed the revolution of coaching, and so, life coaching emerged. The history and evolution of coaching in the last two decades—as a method, product, and service—has mirrored the evolution of change and has produced different roles and expectations. coach training schools grew from 2 in 1990 to 8 in 1995, to 164 in 2004. 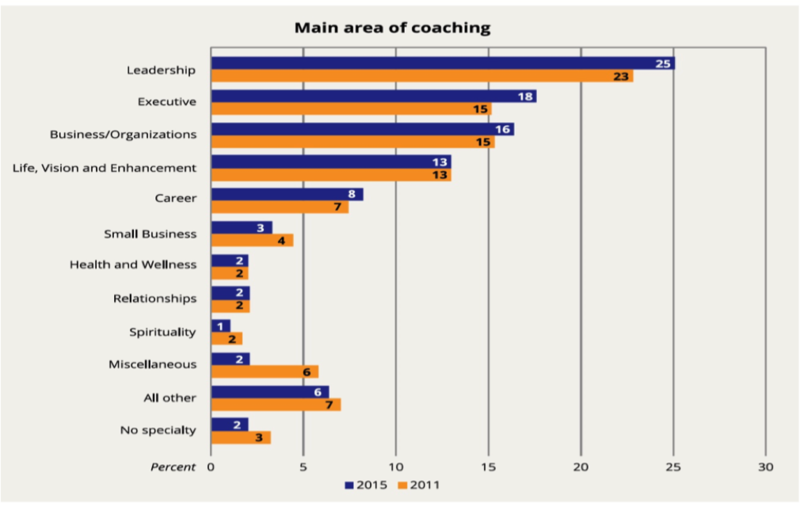 Professional coach associations grew from 0 in 1990 to 12 in 2004, with annual coaching conferences growing from 0 to 16 by 2003. The whole concept of coaching culture came into being about that time and by 2004 was a term commonly used in business. Brock’s view of this evolution is based on the consolidation of the market, increased competition, dissemination by the mainstream media, and the emergence of schools, associations, and standards. I find her three waves to coincide with shifts in how the coaching field focused its efforts and impact. Each focus seemed to trail Brock’s waves by about five years. Life coaching, in the late 1980s and 1990s, peaking at about 2000 (following Brock’s first wave). It focused primarily on the methodology for increasing results in several domains of human life. Performance coaching emerged around 2000, marking Brock’s second wave. It focused primarily on productivity; much of this framed as business or executive coaching. Leadership development (or leadership coaching) emerged in 2015 to deal with disruptive change. At this point, the primary reason that organizations or businesses hired a coach was to cultivate the mindset of a leader to distribute leadership and develop a leadership culture throughout an organization. As we close 2018, this shift will continue. Research from the International Coaching Federation (ICF) has revealed this trend (see graph below and “Specialty” table later in the blog). Focus: Implement a healthy design for various domains of life. Training: Coaching model and method. Expectation: Increase competency in a specific domain of life. Life Coaching applied the powerful model and methodology to a domain of life, such as career, wellness, relationship, small business, etc. Instead of learning a body of concepts via formal education, coaches train in and practice a body of distinctions, delivered to expand perceptions and open possibilities for new action. According to Fernando Flores, distinctions are not names of objects or definitions of terms. “They distinguish something or make it stand out from everything else and to bring it to our attention.” These subtleties of language, when internalized, cause a shift in a belief, behavior, value or attitude. In this view, a coach adopts the model and learns the methodology to hold clients accountable to realizing different views and results for that domain of life. Unlike the medical model or other problem-solving interventions, life coaching began with the premise that people have the answers and that the coach’s role is to help them overcome internal resistances and interferences. Life coaching sought to place inquiries about personal growth into a context of healthy life design, rather than a problem-solving context that diagnosed pathologies. It offered an option for those who had nowhere to turn but therapists, seminars, or self-help books. As a craft or profession, coaching also required that coaches become coachable—that they operate from this model, not just issue concepts, knowledge, or advice. This required adopting a view that focused on the future and implementing practices and personal mastery that deepened listening, and surfaced critical questions to develop a high level of commitment, action, and accountability. In short, coaches are trained to embody the coaching model and methodology. Focus: Goal-oriented, skills-based approach to enhance performance. Training: Coaching model and method, plus business knowledge, skillsets, and competencies as well as training in assessment tools. Expectation: Integrate skills or expand competencies to increase performance. After the turn of the century, coaching intersected with the central professional demands: to enhance performance in the face of change. The model and methodology supported more than strategies for life design—they supported peak performance. Performance coaching emerged to help coaches identify and develop clients’ strengths. Through deep listening, challenging questions, critical feedback, and guidance, performance coaches revealed hidden potential and then worked with clients on practices to sustain it. 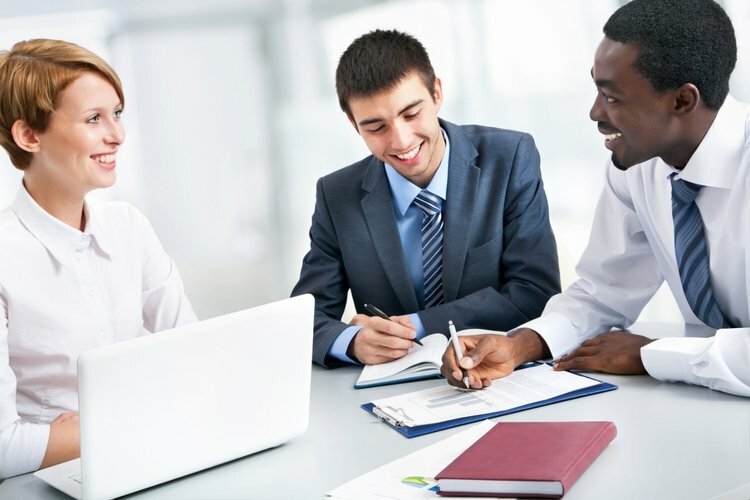 Also called business or performance coaching, the term executive coaching soon emerged to help senior managers, leaders, and directors learn to expand skills and competencies that improved their performance. Developed in 1979, the GROW Model (Goal, Reality, Options, Will, or Wrap-up or Way forward) became one of the most influential methods for executive and performance coaching to engage problem-solving and goal-setting. The model was first published in Coaching for Performance by John Whitmore in 1992. Another important difference with executive coaching required additional knowledge, and training in assessments, such as 360-degree surveys and personality typologies as well as data analysis and business systems. Coaches also became proficient in competencies that manifested in roles (as listed below). The coach dances between these roles and additional knowledge competencies and as applied in a business or organizational context. Focus: Increase capacity to cope with the business and the human impact of change. Training: Coaching model and method, plus additional multi-disciplinary approach to expand mindsets, specifically for leadership and leading change. Expectation: Develop awareness and practices to cultivate or transform the conditions for leadership and learning beyond current perceptions. Newer to the field of coaching, leadership development had emerged by 2015 as a primary method to cope with change, especially for those responsible for leading an organization (C-Suite) and cultivating leadership in others. Essentially, the nature of change today—its pace, uncertainty, and complexity—has focused development efforts and resources on creating the conditions for leadership. Based on my research and experience, this level of coaching moves beyond a focus on assessments, skillsets and competencies and takes responsibility for developing a mindset—that of a leader. This level of coaching involves more education from a multi-disciplinary approach (see below under “Leadership Development”) to increase self-awareness and deepen listening. Leadership development balances “coaching” with a focus on “development.” It includes some of the direction offered by life coaching, some of the roles offered by executive coaching with an emphasis on increasing capacity to cope with the human facets and impact of change. Fundamentally, however, leadership coaching and development deal with all the human aspects of disruptive change, unpredictable future, and learning to learn (often involving a lot of unlearning). It supports leaders in the face of unpredictable change, increased complexity, and the ambiguity and uncertainty experienced by the self. Emerging research finds leadership development moving inward away from content, such as skills and knowledge, and toward context, such as self-awareness, listening, and empathy. The assessment company Korn Ferry has engaged some research on the differences between mid-level-manager coaching, executive coaching, and leadership development coaching. What’s implied in their definition is the need to cultivate learning (innovation) and cope with change and complexity (adaptation at relentless speeds). This requires creating a context from a deeper level of personal mastery. 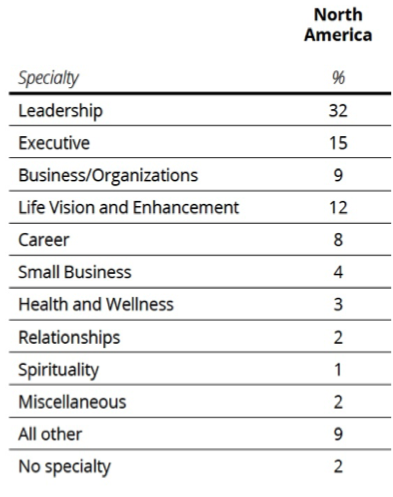 In a 2015 survey, Korn Ferry identified top competencies for mid-level managers, executives (vice-presidents and directors), and leadership (C-Suite), as follows. For mid-level managers that require executive coaching: 1) interpersonal relationships, listening skills, and empathy; 2) influence; 3) communication skills; 4) self-awareness; and 5) delegation and empowerment. For Executives that require a mix of leadership development and executive coaching: 1) interpersonal relationships, listening skills, and empathy; 2) influence; 3) self-awareness; 4) communication skills; and 5) motivation and engagement. For Leaders (C-Suite) that require leadership development: 1) self-awareness; 2) interpersonal relationships, listening skills, and empathy; 3) influence; 4) leading during times of change; and 5) communication skills. One obvious trend is that the competency of self-awareness increases in importance as one expands their level of responsibility in an organization. This is followed by and informs one’s listening, empathy, and influence. The following core coaching competencies by the Association for Coaching illustrate some key areas of knowledge, skills, and practices for executive coaching. Most of these involve horizontal development: improving skills or clarifying roles as distinguished by Robert Dilts in a speech at the 2003 ICF European Conference in Italy. Performance. Through enhancing practice, improving process, or expanding perspective, coaches support someone to learn in order to improve their performance. This often entails supporting, showing, giving feedback, encouraging, and distinguishing new perspectives or practices. Guiding and Supporting. This is the process of directing another person along their path. Coaches provide a supportive environment from which to question perceptions and assumptions without unnecessary distractions or interferences from the outside. Teaching. This relates to supporting people to expand capabilities with an emphasis on learning. It focuses on expanding the capacity for learning by questioning mental models and assumptions. Mentoring. A teacher instructs while a coach provides specific feedback to help a person learn or grow. Mentors, on the other hand, guide us to discover our own unconscious competencies and strengthen beliefs and values, often by example. Sponsorship or Developing Potential. This involves creating a context in which others can act, grow, and excel. It supports constructing identity and core values and awakening potential within others. It involves the commitment to the unfolding of something that is already within a person or group that has not yet manifested to its fullest capacity. Awakening. This extends beyond coaching, teaching, mentoring, and sponsorship to include the levels of vision, mission, and purpose. The catalyst here connects people with their own missions and visions, and thus, the coach needs to know his/her own vision, mission, and purpose. The biggest difference between executive coaching and leadership development (which can be part of executive coaching) is the shift from roles that build skill-sets to disciplines that develop mindsets. This difference supports the shift from developing skillsets or focusing on content to expanding mindsets or awareness of context. Increasing leadership capacity (mindsets) or vertical development entails tapping into a mix of disciplines. This often requires the coach to be knowledgeable about business systems, the nature of the human condition, and the function of change in the business and its impact on humans. Psychological Understanding. Focus on emotional intelligence to expand trust and self-awareness that cultivates and demonstrates empathy. Communications Understanding. Focus on deep listening to give and receive feedback that enhances collaboration. Business Management. Focus on strategic thinking to develop the shared vision that guides change. Learning Principles. Focus on developing potential and appreciative inquiry to expand possibility and foster team learning. Systems Thinking. Focus on observations, insights, and inquiries to question and construct perspectives, worldviews, and mental models. Personal Mastery. Focus on self-discovery and contemplative practices to cultivate intentional practice and generate commitment in any situation. Retaining a coach today may be one of the most important single investments in one’s career. Taking the time to clearly distinguish your needs offers a good first step. If your issues involve a transition in life or a new design for living that entails new strategies or direction, a life coach may offer great support. If you’re looking to improve content or learning skills—optimizing skills or competencies, increasing performance in an area of responsibility or management, managing complexity, or creating new work strategies—then an executive coach may fit your needs best. If your work involves creating or altering contexts—any aspect of leading change through uncertainty or ambiguity, cultivating learning cultures or team learning, expanding perceptions, or letting go of outmoded systems, views, or assumptions—then you may find a leadership development coach to be the most effective. This article complements an earlier White Paper: What is Coaching? Why Retain a Coach? which distinguishes coaching from other human intervention professions.